Jesus foretells his death and resurrection a third time. James and John want a piece of the glory, to sit on either side of Jesus in his glory. According to the Gospels, Jesus’ glory is the cross, his suffering and death, his dying for us. The two disciples will also suffer for the Gospel, for they will learn what it means to be a servant as they lead the family of God. Those in a position of authority are placed there by others, either appointed or elected, although some take it by force. Jesus tells the disciples that in the church, the attitude and demeanor of the one in authority is to be a servant of all. It means focusing on the needs of all. Working and striving for a win-win-win solution for the common good. Those in authority are placed there by God as his instrument of blessing to others. If we are instruments of God, then it will be Jesus’ commands and the leading and power of the Holy Spirit that guide and direct us as we lead others for whom he died into a life lived for Christ, our Savior. Prayer: Gracious Redeemer, give us a servant’s heart and fill us with your love and compassion for all. Amen. The major difference between how Christians are to do things and how it normally works, is humility. Looking at televangelists and their pride leads us incorrectly. 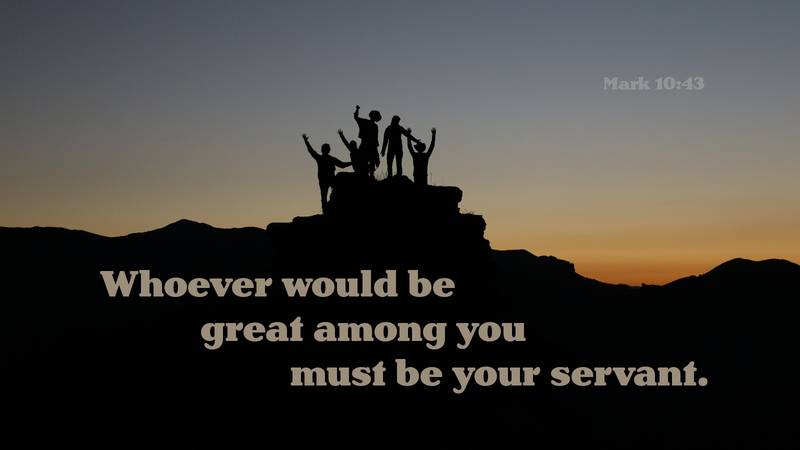 We are to be like Christ himself, who came to serve and not be served. This filters its way down to the congregation as well. We are to humbly serve, not to be served, to quietly work, not bringing focus upon ourselves.